Vivek Dahiya and Divyanka Tripathi make for one of the adorable couples of telly town. 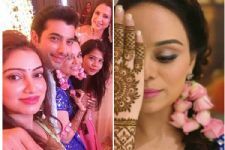 The couple met on the sets of Yeh Hai Mohabbatein and eventually fell in love with each other. After dating for some time, they finally tied the knot in 2016 and have been going strong since then. The duo has been often spotted paying a visit at each other's sets and they never fail to entertain their fans with their pictures from their meeting. But this time it was different. Vivek disguised as a man with moustache, beard and glares and surprised Divyanka on the sets of Star Plus' The Voice. They are indeed giving major relationship goals with this. Vivek never fails to give Divyanka different surprises and this is nothing less. 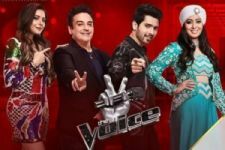 For the uninitiated, apart from starring in Star Plus' Yeh Hai Mohabbatein, the actress made her hosting debut with The Voice. It went on air since yesterday (3.2.2019) and the episode was a complete entertainer. How sweet. Keep slaying away Divyanka Tripathi!